Pammy Blogs Beauty: Color Theory and Dark Undereye Circles: The Science of Color Correction and Pixi Correction Concentrate review! Color Theory and Dark Undereye Circles: The Science of Color Correction and Pixi Correction Concentrate review! This blog post is the 2nd in a series of (I am sure many) articles devoted to covering dark under eye circles. I am a girl who is plagued by *very* dark under eye circles. We are talking black and blue looking dark circles from heredity, allergies, and generally not ever getting enough sleep. I have very fair skin, so that also emphasizes the circles. If you have read my other article Covering Dark Under Eye Circles: My Top 5 Concealers, then you know that I have been on quite the quest for good circle coverage. Consider this post a continuation of the previous article as I would like to add a great new product that I have recently found, Pixi Correction Concentrate to my list of top under eye concealers for *serious* dark circles. 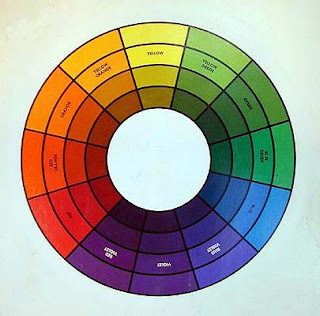 From what I understand of color theory, colors opposite each other on the color wheel are complementary colors. Complementary colors bring out the "best" in the other color. For example, my eyes are blue, so peach eye shadows really make my blue eyes "pop" and look *very* blue. So, complementary colors next to each other make the other look "brighter". Complementary colors also do interesting things when they are brought together or layered over each other: they can "cancel out" the other color. So, since we are talking about my dark circles, which are blue-based, a peach/orange tint would be best used to cover the dark circle. If the dark circles are more "purple" a yellow based concealer could be helpful. So, take some time to inspect your dark circles to help you find where on the color wheel your circles fall. In other areas of your face, you might want to look at redness and consider a green-based concealer to counteract that. Concealers based on "color correction" or color theory tend to be of medium coverage (so not totally opaque) to allow the color theory to "work". This is good for the under eye area as you do not want a "heavy" concealer in the under eye area as this would only look cakey and dry (which would emphasize any dryness or fine lines). So, no need to "pile on" this concealer. Just apply a small amount, and let "Color Theory" do its magic on you! What else am I looking for in an under eye concealer? From what I have learned from various sources, including the fabulous Makeup Geek, the best formulation of under eye concealers is gel-based. These are typically found in jars. How can you tell if the concealer is gel based? According to the MakeupGeek, it has a slight shiny "sheen" to it. This texture is great for under eye as it is not too heavy, it is easy to spread and blend, and it doesn't settle into fine lines. Texture is *key* for the under eye area. What works on the rest of your face will likely not work under your eyes. Your under eye skin is very delicate and of very different texture than the rest of your face. As you all know from my previous Covering Dark Under Eye Circles: My Top 5 Concealers article, I really love BeneFit's Erase Paste Concealer. I will not go in depth here, as I already did in that article. But, I do want to add that BeneFit's Erase paste is a gel based concealer with with peach tones to counteract dark circles. So, it is perfect for the under eye area. I do love this concealer, but is quite pricey. A little goes a long way, so you are getting good value for the higher price. A little jar will last you a long time with this one. So, now on to my new review! I was delighted to stumble across Pixi's Correction Concentrate when browsing at Target a few weeks ago. This is the first item that I have ever tried from the Pixi line. I was happy to see that it was a similar looking formula to BeneFit's Erase Paste as far as texture and at a much less expensive price (I believe it was $14.99). Pixi's Correction concentrate is a very thick and concentrated (hence the name, lol!) gel based product. It only takes a tiny amount of product to cover dark circles. This product is *highly* pigmented. I apply directly to under eye area with concealer brush and blend in. The wonderful texture of this product allows it to just "melt" into your skin. Seriously! Great texture! Leaves a slightly dewy finish. I like to set this concealer with a loose powder (I like either Sonia Kashuk translucent loose powder or BeneFit Powderflage). This product will last all day when set with a nice loose powder. This formula packs in "good for your skin" ingredients such as Vitamin E, Vitamin A, Vitamin C, and rosehips. This small little jar will last you a LONG time as it is so concentrated. Pixi's Correction concentrate is somewhat similar BeneFit's Erase Paste (as they are both under eye brightening correctors with a gel-like base). However, I find that side by side they look totally different with the Pixi being darker and *more peach*. I do wonder if the darker shades of the BeneFit might be more similar to the Pixi? My camera flash kinda "whited out" the Erase Paste in the photo above. But, you can clearly see that the Pixi is way more peach-toned. Also, The pigmentation in the Pixi seems denser and has a dewier or glossier look to it. I must say, I really do like the Pixi better! I think the coverage is better! :) And, its cheaper! So, score!!! When I bought the Pixi I was thinking "oh, this is like my BeneFit Erase Paste", but upon getting it home and really comparing...they are really very different products. I must note that the BeneFit Erase Paste comes in 3 colors and the Pixi Correction Concentrate in one color. I find that both the Pixi and the BeneFit Erase Paste in Fair work well with coordinating with my my very fair skin tone (MAC NC 15). Especially since I only apply these products to the "blue" part of my under eye circles. Overall, I think that the Pixi Correction Concentrate in Brightening Peach is a great product!!! Great price and very similar to the, more expensive, BeneFit erase paste. I like this product so much that I am intrigued by the rest of Pixi's line. Plus, I love the convenience of being able to buy nice, "higher end" products at a store like Target (where the Pixi line is sold). Both the Pixi Correction Concentrate and the BeneFit Erase Paste will give you the fantastic concealing benefits of Color Theory by "erasing" your dark blue circles with the complementary peach color! Also, as always, I love to hear what is working for any of your dark under eye circle issues! I loved this review Pam, thanks! The Pixi Correction Concentrate has seriously become my HG over the last couple of months! It's simply amazing! I prefer it to Erase Paste honestly :) Oh and I've used it everyday since I got it (with a few exceptions) and I haven't made any kind of dent! It goes such a long way! Love it. Hey Ashley!!! Yes, WOW, isn't the Correction Concentrate Amazing! I got the product a few weeks ago...and was testing so many other things that I didn't start testing it until recently...and I was really blown away! I have a feeling this will reach HG status for me too! :) And, totally agree...MUCH better than Erase Paste! :) Thanks for stopping by my blog Ashley! XOXO!!!! @AllMadeUp-Thanks for reading! I hope you get to sleeping better soon, and in the meantime, at least we can rely on good concealer! :) Thanks for reading!!! @Pricilla/MUJunkie-Awhhh!!! Thanks girl! Muwah! Let me know if you try the Pixi!!! :) XOXO! I just found your blog recently while searching for concealer reviews for my New and Not-so-improved 51 year old under eye issues. I'd been searching for an affordable peach gel concealer and decided to try this Pixi one based on your review. Wow, it is true that the peach is so much better than any yellow or other concealers i've tried! Thanks a bunch for the heads up on this product. And my dark creepy (and crepe-y for that matter) under eye circles thank you too. @Shrinky Inky-I am so glad that the Pixi Corrector worked for you!!! Thanks for reading!